Introducing the all plastic Model 8 generation two-bag filter housing from Rosedale Products, of Ann Arbor, Mich., for use in industrial, pure and ultrapure applications. An improved, one-piece design allows the construction filters to flow 100 gallons per minute while offering optimal resistance to corrosion. 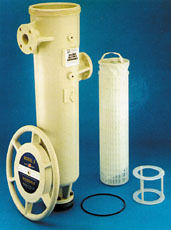 Ordered separately, filter bags are available in many micron ratings.